[miau] Sometimes an online slot machine is not exactly what you would think it would be based on the title. When you see a slot machine named Tiger Treasures, you expect to see a lot of tigers as icons. But this game is actually more about Chinese wildlife than it is about tigers and it is an exceedingly fun game to play. 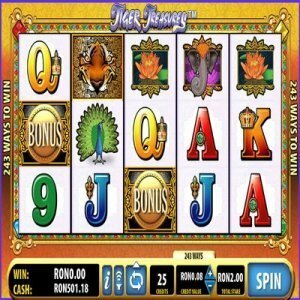 Tiger Treasures is a slot machine with a progressive jackpot and a jungle theme. While there is not real plot to the game, there is plenty to see and experience while you are playing it. The tiger is the animal that brings the biggest rewards in this game, but you will also find animals such as pandas and monarch butterflies in this game as well. If you love exotic animals, then you will enjoy Tiger Treasures. There are a lot of icons in this game and they all have some sort of attachment to Chinese culture. There are gems that are native to China, some Chinese lettering and bamboo branches that are found on either side of the reel background. The developers of Tiger Treasures really did a great job at creating colorful and detailed graphics that make this game worth looking at. The sound and sound effects on this game follow the icons you see on the screen pretty much exactly. You may want to brace yourself if you get a tiger symbol that triggers one of the tiger bonus rounds because the tiger’s roar is extremely loud and very impressive. 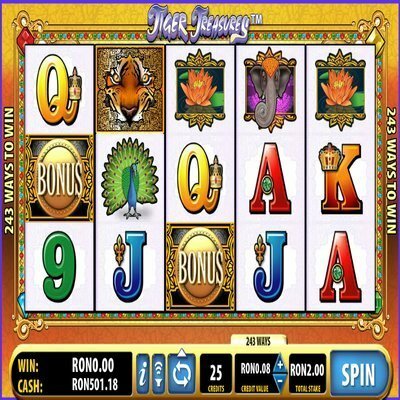 Tiger Treasures is a five-reel game with 20 pay lines. The tiger icon acts as a wild symbol during regular game play, but turns into the primary icon when you reach several of the bonus rounds. One of the big benefits of Tiger Treasures is that bonuses and winnings are counted going across the reels in both directions. First you get your bonus going left to right, then it comes back right to left and does more bonus calculations. The tiger only appears on reels two and four during the course of regular play, but its ability to create bonus situations makes this game well worth the investment. There are a lot of multipliers in Tiger Treasures, so be sure to make the max bet with each spin. The scatter symbol in Tiger Treasures actually does more harm than good, but it does not appear nearly as often as the tiger does. This slot machine is a lot of fun to play and it is also beautiful to look at. There are a lot of good reasons to give Tiger Treasures a try.